It’s staggering to think about how much money both online and land based casinos make from the pokies alone. On average, casinos profit more from the pokies than from any other casino game, so it’s only natural to wonder if the pokies are rigged. This article will clear your suspicions, answering this highly pondered question once and for all. So, are the pokies rigged? It’s a complicated question to answer. The short answer is yes. A slightly longer answer is yes, within reason, or yes, but only in the context that all casino games are rigged to the extend that they are fundamentally created to benefit the house. But it’s not as simple as a yes or no answer, with many factors to consider and questions remaining. For one thing, if all casino games are rigged, then how do casinos do so well? If you have heard the saying “the house always wins” this is fairly close to truth, but while close, it is not the complete truth. For example, there is a difference between rigging a game of roulette so that the ball always falls into a losing number, such as the green zero, and rigging it so that you have a 37 to 1 chance of hitting a specific number yet you only get 35 times your bet if you hit it. This is the legal and acceptable way that the casino profits over time. What constitutes rigging a game? The devil is in the details, so they say. To rig something means both to fix or arrange something, and to do so fraudulently. Since casinos set up their games to work so that the casino profits in the long run, it is constituted as rigging, but in the sense of the first definition and without fraudulence or deception. Most casinos fall under some sort of governmental jurisdiction that regulates gaming within the walls of its establishment. This is true for both online and physical brick and mortar casinos. For example, Australian casinos have to allow (ie, rig) their pokies to payout no less than an 87% RTP (return to players). It is important to note what this RTP percentage does and does not mean. It does not mean that if you play pokies in Australia you will win 87% of the time. It does not mean that pokies are on timers that, if they haven’t paid out yet, have to automatically award a jackpot in order to stay within the regulated percentage. What 87% does mean is that over time, for every $100 a player puts into a machine, that player will, on average, get back $87 of that original $100. One final thing to consider about the rigging of casino games is that if a casino is not licensed and audited under the jurisdiction of a regulatory body, rigging in the fraudulent sense of the word is entirely possible, and highly likely. That’s why it’s vital that when playing pokies online, you play at a legally licensed and regulated casino like any of the venues recommended across our site. Not only are all of our endorsed casinos 100% licensed by reputable gambling jurisdictions, they also come with better RTP percentages than their land based counterparts. The gaming software is also audited and certified by eCOGRA, the leading authoritative body for the online gambling market. Gambling is a fun and an occasionally lucrative way to pass the time, but it can only truly be enjoyed when it is safe. Avoid gaming in questionable establishments, and only play in places where you can easily determine what jurisdiction they fall under and who regulates gaming for them. Remember the golden rule of gambling online: if something seems too good to be true, it probably is. It will also help to familiarise yourself with our list of rogue online casinos to avoid. The 87% RTP payout rate that Australia mandates for the pokies in its gaming establishments is derived from a probabilistic model and determined based on maths. A common myth about these machines is that they are set to deliver a jackpot after a certain amount of time, so find the machines that are running hot (supposedly machines around the entrance to the casino provide a higher chance of winning) and you will get rich. Unfortunately, this notion is based on a mistaken understanding of how pokies work. You can read more about pokies myths here. To understand how probability works, consider this basic example. If you flip a coin, you have a one in two chance (also expressed as 50%) of hitting tails. This probability has nothing to do with what has come before, which is the mistake gamblers make of thinking previous results will affect a current result. If you flip a coin nine times and get heads every time, your chance of getting tails on the tenth flip is still 50%. You can consider the chance of a set of results – for example, the probability of hitting heads ten times in a row – but this is determined after the fact. Even if you have hit, or in the case of pokies, failed to hit a number of times in a row, this will not change your basic probability of hitting on your current turn whether that is a turn at flipping a coin or a turn at spinning pokies. Furthermore, the 87% number is not to be confused with the probability of winning. This payout rate is based on probability but not probability itself. 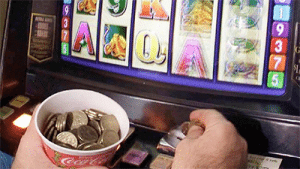 Probability in pokies is easy to determine if you have all the information available. Unfortunately, this is rarely the case. The older mechanical pokies worked on a multiple reel system. Each reel would have all the symbols on them, and machines would spin a number of reels, usually three or five, in order to match the symbols. If a reel has ten possible symbols, the probability of hitting one of those symbols is 10% (1 in ten). In order to hit that symbol on all three reels, for example, you would multiply those chances for each reel together. In this case, it’s easiest to express the probability as a decimal or a fraction: 10% = 1/10 or .10, for example. If you multiply .1 x .1 x .1 you get .001, or a .1% chance of hitting the jackpot (also expressed as 1 in 1000). This assumes that a reel has ten distinct symbols. If pokies have some symbols that are worth more when they match, the game designers can make it so that these symbols come up less often. Instead of having 10 symbols on a reel with 10 distinct options, you can have 10 symbols but 25 options on the reel where the worst payout is repeated five times, the second worst is repeated four times, and so on, so that you have a higher probability of hitting the lesser paying symbol than you do hitting the higher paying symbol. Designers of pokies then make sure that all the different payout possibilities average out to better than an 87% average in order to meet the regulation requirements. Casinos frequently can readjust the frequencies of symbols to tweak the payout if the machine is not meeting its regulatory commitment when the machine is a video pokie. This is often a difficult procedure and casinos change the probabilities on their machines infrequently. The bottom line concerning pokies is they are set up to pay you back less than what you put into them over time. 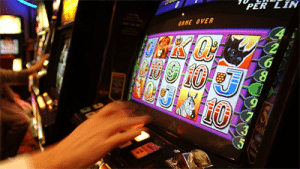 Winning money on pokies is a matter of luck and it’s best to keep track of what you have gambled and quit while you’re ahead. Your best bet is to to enjoy the pokies while betting within your means, and stick to playing online, where the RTP payouts are better. Is it possible to cheat on the pokies? For a safe online pokies site that’s well protected by testing agencies to ensure against rigging, we recommend checking out Raging Bull Casino, our top-rated casino site for players from United States.